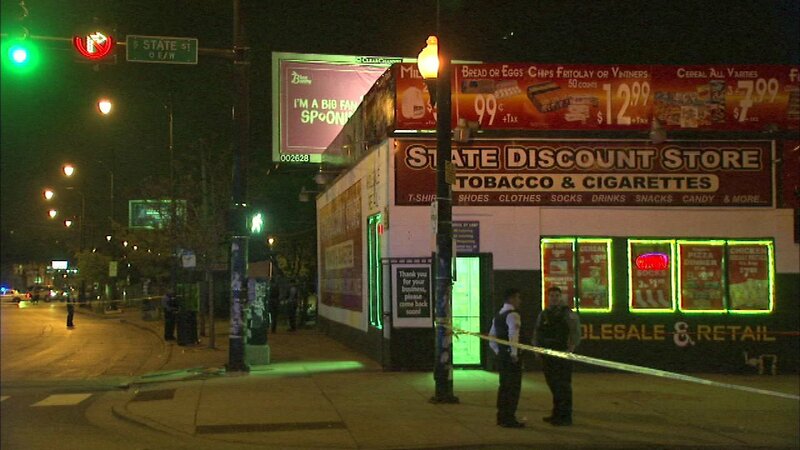 CHICAGO (WLS) -- Five people were shot at a bus stop in Chicago's Park Manor neighborhood on the South Side. Police said a group of people were waiting at the bus stop near West 71st and South State streets just after 8 p.m. Wednesday when several people ran up to them and opened fire. They fled in a getaway vehicle. Four men and a woman were wounded in the shooting. Witnesses inside a nearby corner store ran to help. Morad Alsars was one of them. "I got some regular towels and just put them on her head, held them a little bit until the meds came," Alsars said. Mohamed Razek, who works in the store, said the woman who was shot was a regular customer. "I know the people by faces. I don't know names, but the lady shot in the face was in my store right there," Razek said. The 32-year-old woman was shot in the head. A 20-year-old man was shot in the chest. They were taken to Stroger Hospital, where they are both listed in critical condition. A 27-year-old man was shot in the left thigh. A 20-year-old man was shot in the arm and back. They were taken to Mount Sinai Hospital, where they are listed in serious-to-critical condition. A 26-year-old man drove himself to St. Bernard hospital and Health Care Center, where his condition stabilized. It is unclear where on his body he was wounded. Investigators are trying to determine a motive for the shooting. The corner store said it does have surveillance cameras that may have captured the shooting, but their recording devices are full. Police did not give a description of the suspects. No one is in custody. At least four people were injured in a shooting Wednesday night in the Park Manor neighborhood on Chicago's South Side.